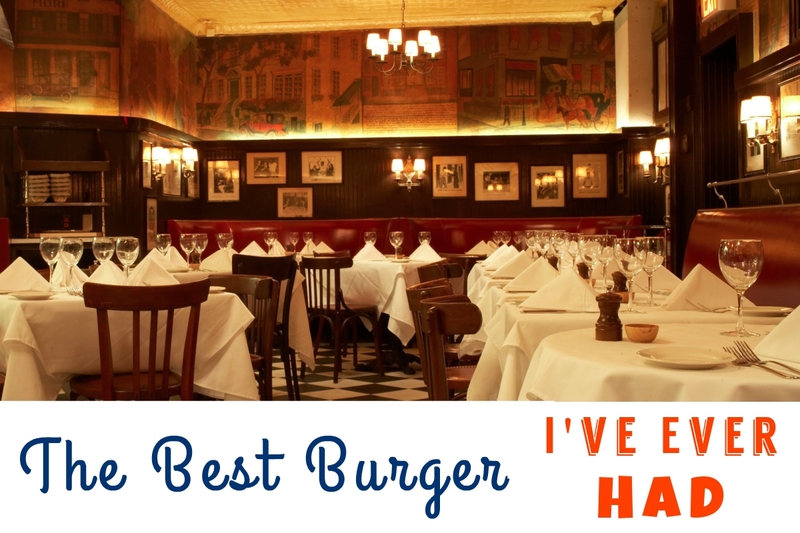 I should clarify by what I mean as “the best burger ever” because I normally don’t go around ordering $28 burgers. When it comes to your everyday burger, Shake Shack is where it’s at. Sorry in-n-out. But I mean have you tried the Shack Stack? I absolutely love the animal style cheeseburger when I’m in California, but I would take the Shack Stack over that any day. Minnetta Tavern is a very cool place that’s packed with old school charm. It opened way back in the 1930’s and still has that classic and classy feel to it. The establishment is steeped in history– which is evident when you step inside the Tavern– and used to be frequented by literary legends such as Hemingway and E. E. Cummings. The whole experience was one of a kind. For appetizers we ordered the Veal Carpaccio with Burgundy truffle, shaved artichoke and vacche rosse Reggiano and the Huîtres et Crépinettes with truffled pork sausage meat balls with salt pond oysters on the half shell. Both dishes were amazingly delicious! The truffled sausage meat balls were insane. 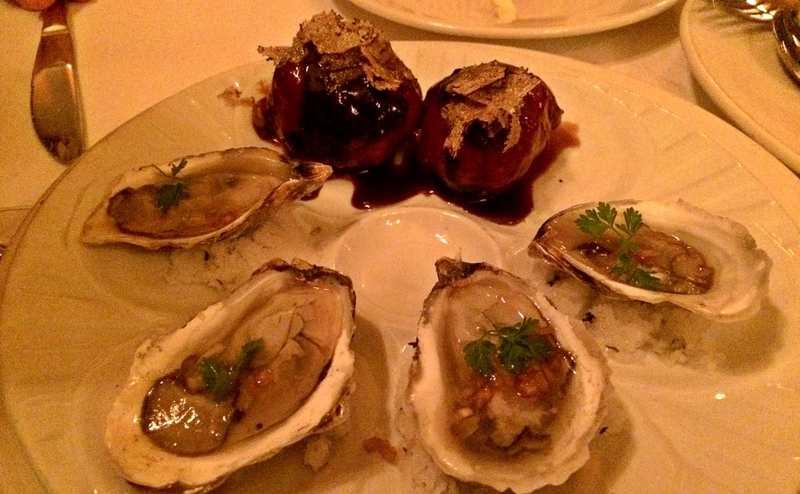 I thought it was odd they came with the oysters- but once I stared eating them I had zero complaints! 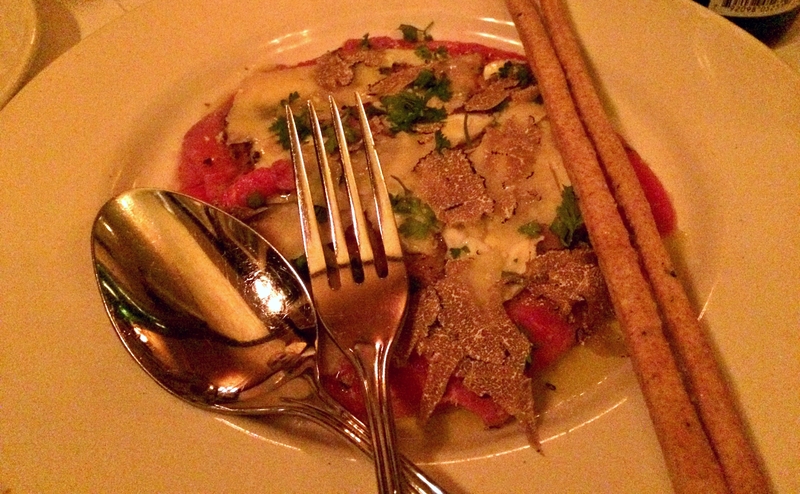 The carpaccio was super tasty too. I usually don’t order carpaccio because eating raw meat always seems so weird to me. But this meat was sliced just right– thin, but not too thin– and was seasoned perfectly. 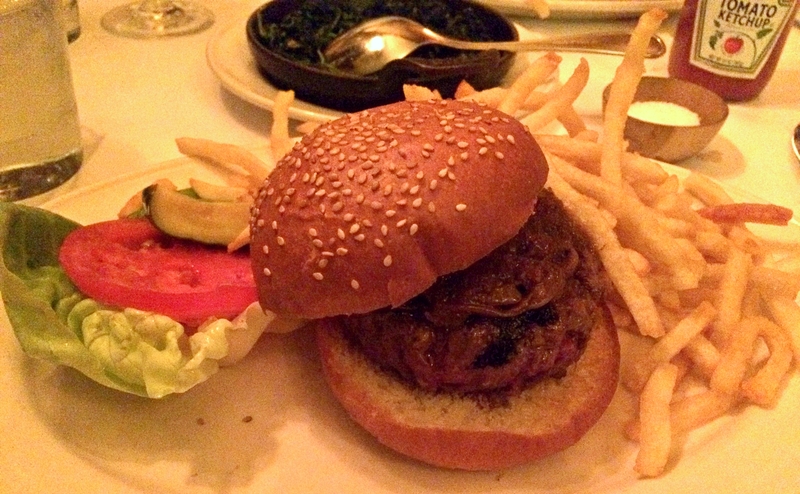 Now, onto the best fancy pants burger I’ve ever had- Minnetta Tavern’s Black Label Burger! This burger was on point. 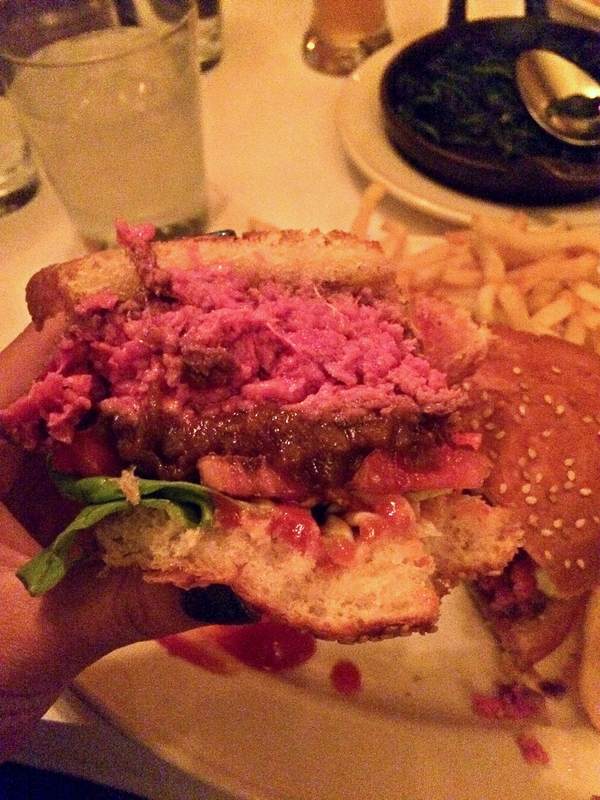 I rarely am impressed by burgers– and normally douse them in ketchup and mayo. I generally lay the extras on heavy- pickles, onions, peppers, cheese, bacon… you get the picture. But the meat of this burger was unreal. So juicy, flavorful, rich, savory… melt in your mouth good. Like who knew a burger could rival a steak in terms of oh-my-goshness? I know Minneta Tavern is famous for this burger, but experiencing it first hand really made it clear why! I was concerned when they suggested I don’t order cheese on it- I always have cheese on my burgers. But their caramelized onions was all I needed in the end. After reading up on why this burger is freaking epic, I found out the meat is actually blend of 4 kinds of cuts of Beef: Short Rib, Skirt, Brisket and Dry-Aged Ribeye. Also– not so shockingly– it’s basted in clarified butter throughout the cooking process. I mean, butter does makes all things better! 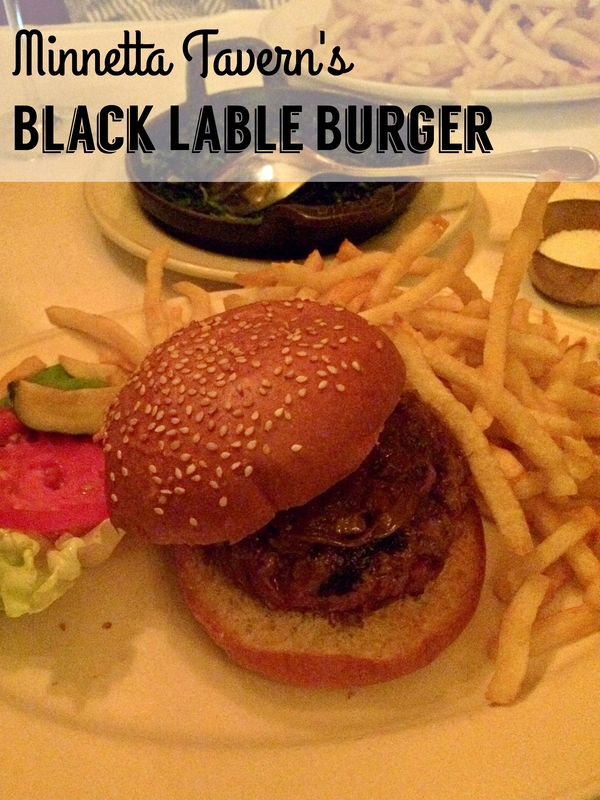 Amazing, crazy good meat blend + butter = Black Label Burger = the best burger ever. Now, the dessert was also special. We committed to ordering it at the very beginning of the meal- because that’s how long it takes to bake perfection. 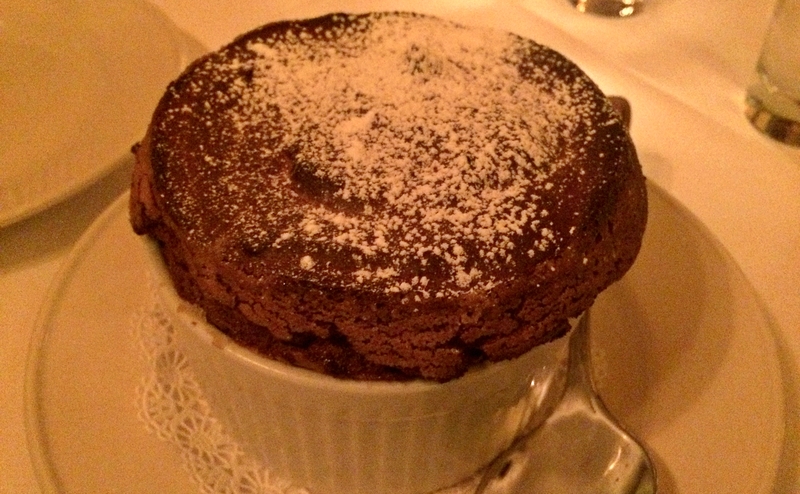 The Chocolate Souffle was rich, decadent, fluffy and ridiculous. After I broke though the powder sugar dusted top, the middle was a molten pool of decadent chocolate deliciousness. I, of course, never being one to deny herself greatness, also ordered the vanilla ice cream to balance out the richness of the souffle. I. Was. Stuffed. And then I died. Because it all was so good. OMG! Four kinds of deliciousness? Wow, Chey, you’re so blessed to eat these scrumptious foods. That is an epic blend of meat for a burger. Was that cooked medium? Because that’s a hell of a lot of pink!